If you have been fortunate enough to visit the Suffolk Public Library, you know what a fantastic job they do of making their libraries fun, go-to places for free things to do in Suffolk. They won Gold for Family Entertainment in the Pilot Readers’ Choice Awards 2018. They really think outside the box and engage the public with programs ranging from Trashion Shows – making clothing out of recycled materials, to Black History Cupcake Wars – designing cupcakes based off of historical black athletes who have paved the way for future generations to participate in sports. Amazing! They really are living up to their vision statement to create an informed, enlightened, and thriving community where all can achieve their highest potential. With such a community-focused vision, it was not surprising the Library added Litter Cleanup Kits to their catalog of lendable items! Yes, that’s right! 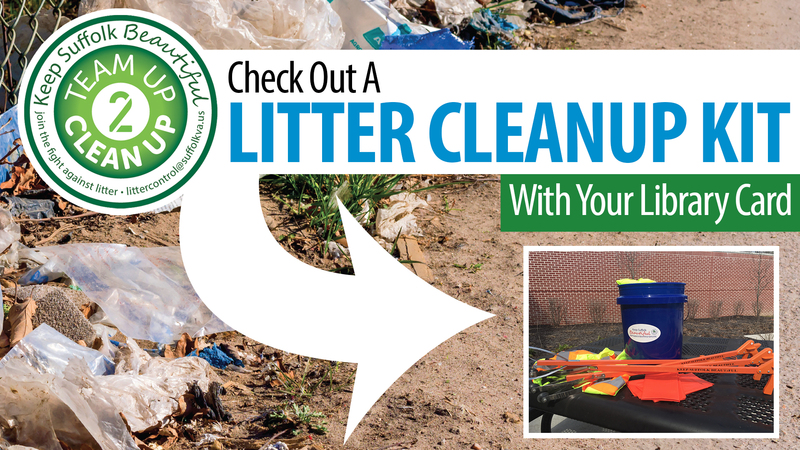 An adult with a Suffolk library card can borrow four litter grabbers, safety vests, bags, and buckets to take home and pick up litter in their street, ditch, or neighborhood. The kits were made available in May 2018, and after six months had been borrowed 17 times. That’s awesome and goes to show there are a lot of us out there that can’t stand litter and want to do more to make our communities cleaner. The Suffolk Library Litter Kit Lending Program even got the attention of the American Library Association (ALA) Public Programs Office, a national organization that put Suffolk on the map when they included the program in a piece they did – “‘Check Out’ All the Creative Things Libraries Circulate.” The program has also sparked interest from multiple other Hampton Roads library systems. So, next time you visit the Suffolk Public Library to grab a book, think about picking up a Litter Cleanup Kit and hit the street for a family cleanup. Your neighbors will truly appreciate it, and you may inspire them to do the same. If you are not a member of the Suffolk Public Library and would like to see this available in your part of Hampton Roads, contact your library or local government and suggest it. We all can make a difference when we Team Up 2 Clean Up!!! Guest blog submitted by Wayne Suffolk, Litter Control Coordinator for the City of Suffolk.